Bunco Dice Game Rhinestone Bling Ladies Tshirt. Professionally heat set to a shirt or accessory. Bling Out Loud uses high quality, low lead, Korean hotfix stones. These stones are machine cut and have the best clarity, shape, and durability for the price. More affordable that Swarovski, Korean hotfix stones have great light refraction, and, when properly applied, will last through hundreds of washes. 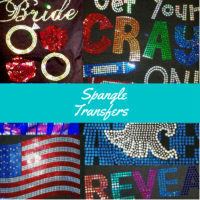 Spangles are flat, “holeless” sequins. They are holographic so have fantastic light refraction. They are Lead Free and therefore safe for all ages and adhere to child product safety regulations. Because spangles are flat and very lightweight, they are perfect for large designs. They are also more economical than regular rhinestones. Bling Out Loud uses a state of the art, automatic screen printing press to provide beautiful, durable screen printed tees for groups and B2B. We offer graphic design services or can work from your logo or idea. Turnaround time is usually under 2 weeks and pricing is based on number of colors and locations. 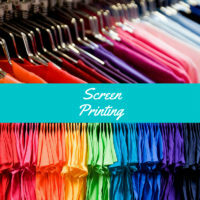 Screen printing is best suited for line art and simple designs with limited (spot) colors. Bling Out Loud offers a wide selection of apparel and accessories for decoration. 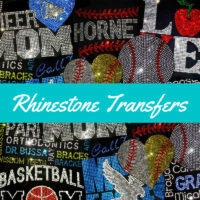 DIY Instant Download files are available for rhinestone designs and vectors for HTV. Download files for B2B CAMS and ProSpangle machines are available for many of our rhinestone designs.